The Daily Telegraph has launched MyTelegraph, a new service that enables readers to set up and personalise their own blogs. It’s an interesting move, and the first of its kind by a UK newspaper. MyTelegraph was launched at the end of last week, and by last Friday, had a thousand registrations, 500 bloggers, 800 blog posts and 2,500 comments. 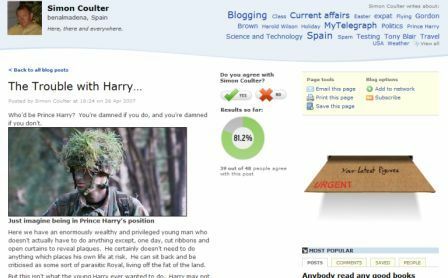 While other newspapers have blogs, or allow users to comment, MyTelegraph allows users to create their own blogs, profiles, write their own blog posts, and personalise their blog pages. You can vote on each blog entry to show whether or not you agree with the writer’s article. Once enough votes have been submitted, a graph is generated to show the percentage of people that support the blogger. Over time, this should let readers know who some of the more trusted and influential users are within the MyTelegraph community. The most viewed, commented on, and saved posts are displayed also. Another attraction for some bloggers will be the URL they get on registration: my.telegraph.co.uk/myname. MyTelegraph is very impressive – its designers have created an easy to use blogging platform which makes it easy for non-technical users to start their own blog. A human resources firm has warned that up to a third of bloggers and social network users risk the sack for posting damaging material about their employer. Croner commissioned YouGov for a survey of 2,000 people which found 39% of bloggers admitted to publishing sensitive or damaging posts about their workplace. US online shopping gateway Mpire has launched a number of widgets designed to generate revenue for Amazon and eBay affiliates. The widgets, when displayed on a user’s web page, chart trends across a range of retail product categories, each allowing site visitors to make a purchase that is linked to a publisher’s affiliate account.